Universal Document Converter - Convert PDF and other office documents with ease! Exchanging documents in the Adobe PDF format protects you and your clients from any technical difficulties. Documents converted to JPEG or PNG graphic formats can be easily inserted into your PowerPoint presentations without any problems. Publishing presentation materials and product catalogs in the Adobe PDF format offers clients all needed information in a reliable and change-protected form. Converting documents into the TIFF format guarantees high printing quality and simplifies work with printshops and publishers. Universal Document Converter reduces your expenses on the development of a corporate workflow system. Save Documents as PDF or Image with Universal Document Converter 6.0! fCoder Group, Inc. announced the newest Universal Document Converter 6.0 release. With the updated version of Universal Document Converter customers are able to convert any type of a document into an image file or save document as a searchable PDF. Universal Document Converter 5.8 now supports Microsoft Windows 8.1! fCoder Group, Inc. presents Universal Document Converter 5.8. This new version is compatible with Microsoft Windows 8.1 and contains several fixes as requested by customers. 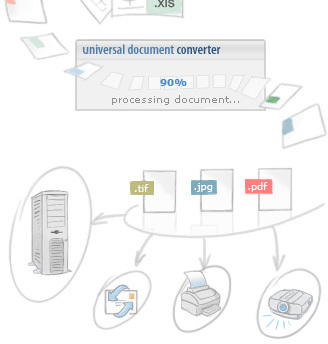 fCoder Group presents Universal Document Converter 5.7. The new version of the program features numerous fixes and enhancements suggested by users. We are very satisfied with Universal Documents Converter, which we use many times every day. As Universal Document Converter is only a printer driver it is fast and easy for us to use! In the past we had first to print documents and then to scan them to TIFF format for archiving. Now we are using Universal Document Converter, which enables us to save a lot of time and paper. The easy of use and the ease of outputting documents to a graphic file format makes Universal Document Converter a must for any business, webmaster or individual user. The result of each conversion is very, very close to the original. It is important for us because we have to print on preformatted paper and we cannot accept any difference! Marc Dubray, Honeywell International, Inc.